One of Eisenhower Medical Center’s supporting commitments is to provide a healing environment for all patients, visitors and staff. Through a generous donation by Eisenhower donor Madeline Redstone, the hospital upheld that commitment with its installation of Dale Chihuly’s “End of the Day” Boat on Jan. 4. Nearly 100 attended the unique, invitation-only affair highlighting the hospital’s culture of intertwining a healing environment with health care. The event also continued the hospital’s year-long celebration of its 45th anniversary. Landes then asked Redstone up to the podium for the unveiling. He mentioned how important both Redstone and her late husband, Edward “Eddie” Redstone, were to the growth of the Medical Center. Redstone shared a brief story of how she procured the “End of the Day” Boat and Eddie’s love for Eisenhower Medical Center. “He knew that the hospital would be not only one of the best hospitals in the state of California but also the country. And it is,” she said. Art curator David Austin shared a sweet story of a patient watching the Chihuly installation. He asked the patient if they knew what they were looking at, “She replied, ‘no, but it makes me happy…’” — truly an indication that Redstone’s generous gift will benefit everyone who experiences it. 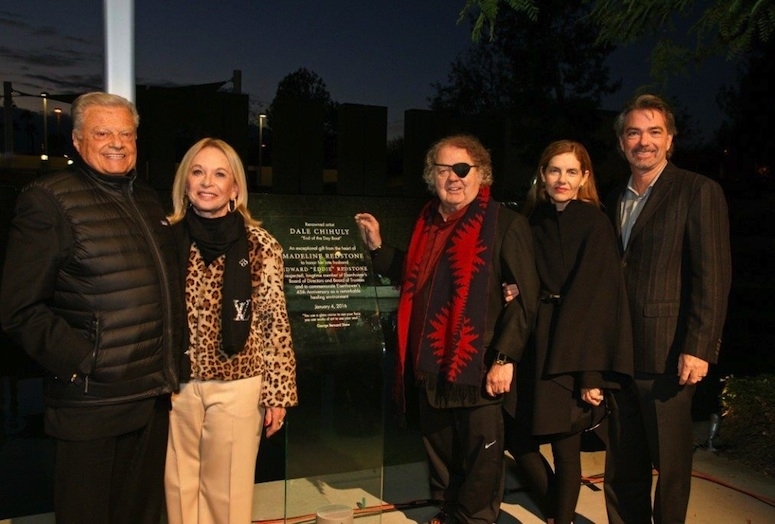 Special guests included Chihuly and his wife Leslie, Jan Salta, Harold Matzner, Helene Galen with Jamie Kabler, Lori Serfling, Angie Gerber, Alan and Helen Greene, Greg Renker, Connie Norton, Sally Berger, Donna MacMillan, Leisa Austin and Bobby Holland.